GIVEAWAY | The Berry Brand in Tustin is A Build-Your-Own Superfoods Heaven - EAT WITH HOP! When it comes to build-your-own establishments, quality is sometimes compromised in order to provide an array of options in a fast and casual environment. However, I am happy to say that The Berry Brand in Tustin serves great quality superfood bowls without sacrificing customer service and quality. 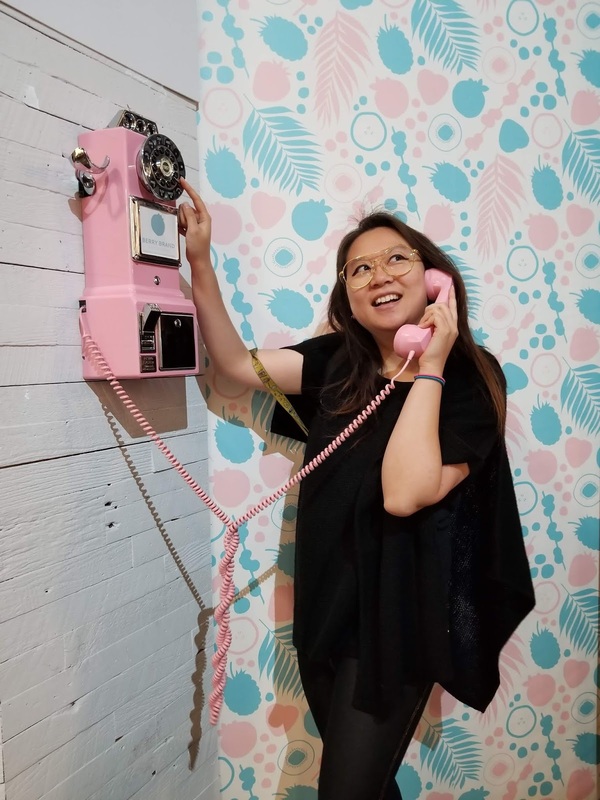 Even the decor is cute and the "Instagram-friendly" photo area is well-done with a pink phone! And there are so many options too! Over 20 options to mix and match into your bowl - unlimited. *Disclosure: I was invited to The Berry Brand as a media guest to try out their menu. No worries though, because all opinions are mine and won't be swayed by the free stuff I got. I like to keep it real, yanno? @OCFoodFiend and I went together to The Berry Brand and got two 24oz superfood bowls! 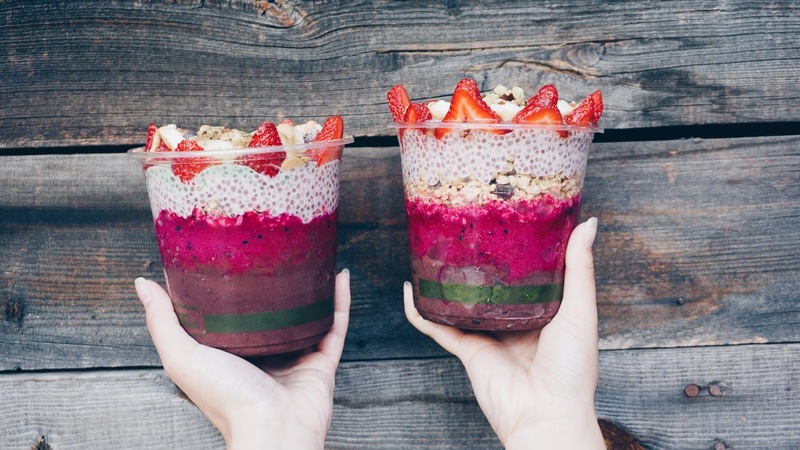 We got all of the bases including acai, pitaya, pitaya chia pudding and matcha chia pudding. Yummm! Topped it off with a bunch of granola and fruits. As you can see, here is the menu! If you are familiar with another popular build-your-own superfood bowl spot called Blue Bowl (in Orange) and also Acai Bowl Co. (in Mission Viejo), then let me tell ya, I did my research! The sizes + prices are exactly same. Only difference is Acai Bowl Co. does not offer 24oz option. Look at the staff hard at work making the bowls look perfect! This is @OCFoodFiend (Kathy) getting her Instagram shot in! Don't these bowls look perfect?? This is what the matcha chia pudding looks like! As you can see, it isn't super green or anything but more of a light green. Although the flavor isn't super matcha-y, it is still there and the more you eat it the more you'll probably taste it. I do wish it was a bit stronger though since I also make my own matcha chia pudding at home and dump all the matcha powder in mine LOL. Oh... you know, just trying to hit up some of my berry good friends. Eyyy! Someone come over and eat The Berry Brand with me! Let's chill! 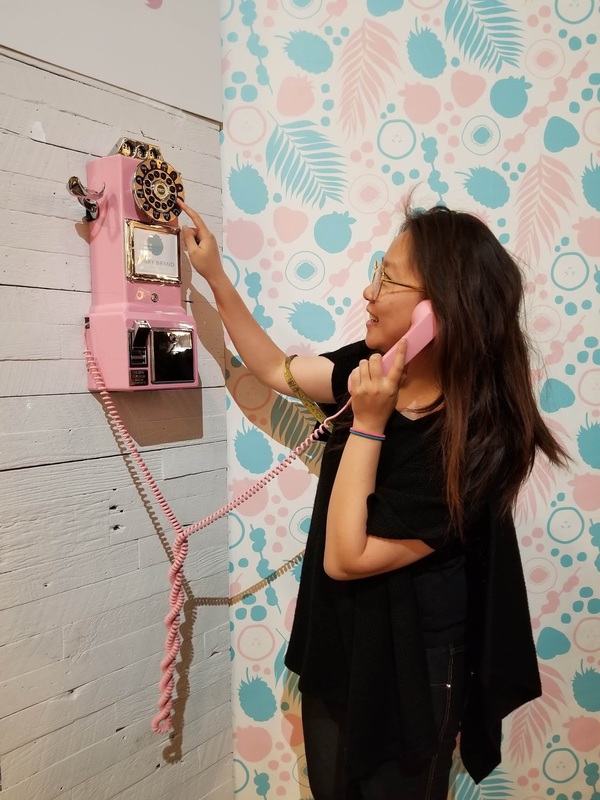 Shoot... who should I call next? Okay, so I gotta be honest. I am loyal to Blue Bowl in Orange. Even after trying Acai Bowl Co. (Mission Viejo), I still like Blue Bowl more (and Blue Bowl is closer to my house) because of all the BASE options it has. I hate the parking though but damn, it's still worth going and fighting over parking. So when I heard about The Berry Brand opening, I was already a bit biased because I am so obsessed over Blue Bowl already. But, at the same time, I am glad another build-your-own superfood bowl shop is opening up! Why is this not already a thing that is poppin` up everywhere? I hated going to Nekter (or similar places) and ordering this and that but substitute this and that and omitting this and that. A Build-your-own customizable way of ordering is just soooooo much easier. Anyway, I was impressed at The Berry Brand. Damn, the decor is cuuuuuute! And they kicked it up a level with the chia pudding options. The Berry Brand isn't basic. It's actually worth trying and has so many options as well! Albeit, not as many options as Blue Bowl but that's probably because The Berry Brand has a smaller space. They might roll out more options in the future too so that will be exciting! COMPARED TO BLUE BOWL AND ACAI BOWL CO. When it comes to taste, all three places are basically the same. Even the prices are the same. If you choose the same options from all three spots it'll probably be similar (if not basically same) in taste. So what sets them apart now, are the variety of options. Let's talk about the most notable unique options found at these places. if it's the same matcha powder brand used at Milk Box, then it's good quality stuff yo. Ippodo brand! p.s. 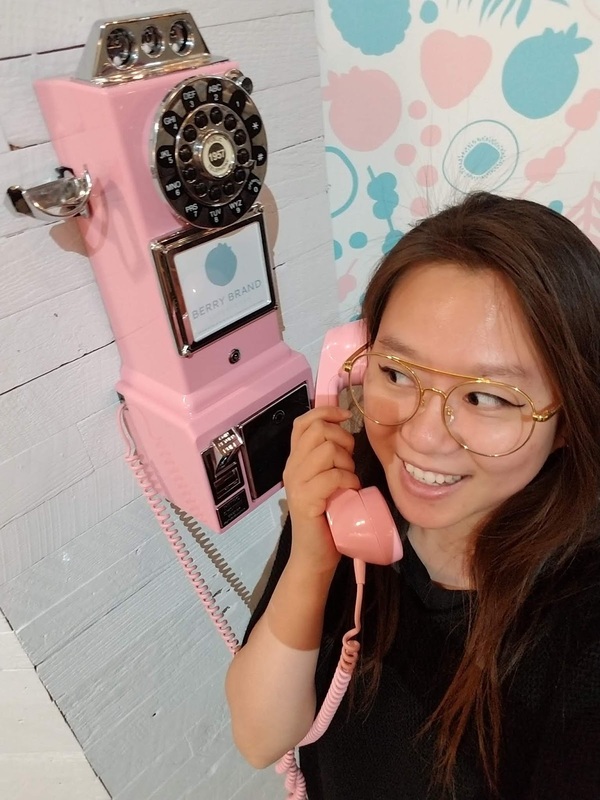 The Berry Brand is also owned by Truong, who also owns Milk Box. This is what I love about this place. You can get one base or all the bases. I personally like pitaya + matcha chia pudding + pitaya chia pudding. And I top it all off with tons of fruits and granola and cacao nibs. Also, gotta sprinkle that matcha powder on top! The Berry Brand will discount $1 off your bowl if you are a student, teacher, nurse, doctor, or a veteran. Just show your ID to get the discount! Hope this review was thorough enough for y'all! I definitely recommend The Berry Brand for all your superfood bowl cravings. It's like a meal replacement for me and so so delicious. Basically like a dessert meal because it's basically fruit on top of naturally sweet things! Yay for build-your-own customizable superfood places! As part of the June 2018 Monthly Giveaway, I am happy to announce that I am partnering up with The Berry Brand to do a special giveaway for y'all, my wonderful Taste Buds! I am choosing 2 winners to win a $20 certificate each! Note: Last month I said that I probably won't be doing anymore giveaways because I am moving to Korea for the summer. But... JUST KIDDING! I found partnerships where I won't have to personally mail the prize so I can still do these special giveaways for y'all. Have you heard of The Berry Brand before reading this post? What base would you choose or sounds most interesting to you? Pitaya? Acai? Matcha Chia? Pitaya Chia? Or ALL ?! 2. (optional) Check out The Berry Brand on social media! Check out Hop's NEW Lifestyle blog here. 4. (optional) Share this post! Spread the word! The more the merrier! Good Luck Everyone! Two winners will be contacted via e-mail the first week of July!